In my senior year of college, I shared an off-campus dwelling on Stockbridge Avenue with five other roommates. Walk down to the end of the block and make a left on Bailey Avenue, and you were a ten-minute hike from U. B. (that's the State University of New York at Buffalo for the uninitiated). Walk down to the end of that very same block and make a RIGHT and you pretty much immediately found yourself at the front door of Anacone's, a quaint little neighborhood tavern!! This being the years of higher learning and all, me and the boys sometimes found ourselves exiting stage right seemingly as often as we did stage left!?! While it was nothing like the extreme binge drinking you hear about on today's college campuses, we did spend some significant time unwinding after oh-so-stressful days. Playing pool, eating Buffalo wings or a nice hot Beef On Weck at the local inn--all that, and yes, pitchers of lager were indeed quaffed. (Recall please if you will that back then the legal drinking age was 18--and no driving was involved due to the proximity). My buddies were a fine group--mostly engineering students, unlike yours truly, the art major. None of them, however, shared my undiminished enthusiasm for the comics' medium, though--with one partial exception. 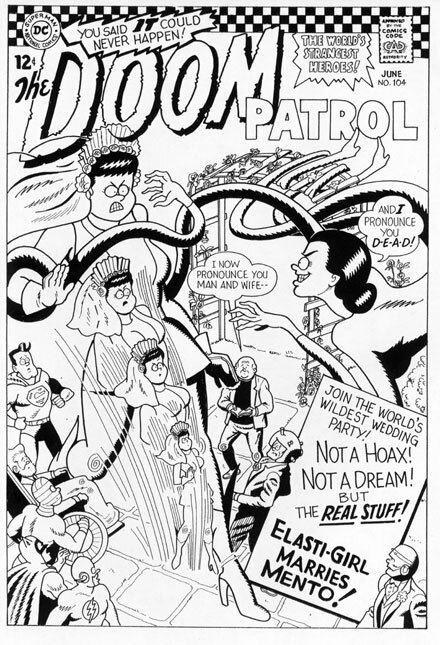 Ah yes, the Doom Patrol!! Back in the early sixties, it was the first DC title to seem anywhere NEAR as cool as a Marvel comic!! And why not? They were a similar aggregation of misfit heroes suspiciously akin to the far more famous X-Men, though to this day, there's some question as to whether the near simultaneous debut of the two series was merely a set of massive coincidences, or a case of low grade corporate espionage!?! Who stole from whom? Was the basic concept pilfered? And if so, there's a lot of evidence, shockingly, pointing NOT towards Arnold Drake, Bob Haney, Bruno Premiani, and Murray Boltinoff as the culprits, but "choke" Stan Lee and Jack Kirby!?! But that's a whole nother bag of beans-- the point I'm attempting to make is just how ingratiating the Chief, Robotman, Elasti-Girl, and Negative Man actually were. Because I honestly couldn't tell you exactly HOW it started--perhaps we'd had just a bit too much of Anacone's primary product--but one peculiar night, there we were, at a small table, seated with Steve, Bob, Brad--maybe even Lynn. With thoughts of our earlier discussion concerning the so-called "Fabulous Freaks" undoubtedly on our minds, Rick and I looked across the table at one another, and almost as if we'd rehearsed it--but we DIDN'T, I swear! 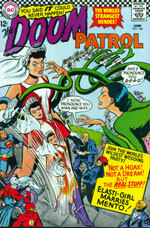 !--began chanting--quietly at first, but soon rising uncomfortably (for our hapless companions) in volume--" Doom Patrol. Doom Patrol. Doom Patrol! DOOM PATROL!! DOOM PATROL!!! DOOO-MMMMM PAAAA-TROOOLL!!!!" Luckily, before we'd TOTALLY embarrassed ourselves, our designated quieters shushed us, and quickly escorted us back to our dorm-like domicile!! "Save it for the house, guys!" --That was their curt message. And, not anxious to make complete fools of ourselves, that was where it stayed forever afterwards. But you know what? It didn't take much prompting in the days and months that followed to get a good, enthusiastic and-- you better believe it--LOUD Doom Patrol chant going!! Y'know, I can still hear Rick's voice joined with mine in a lusty, alcohol fueled repetitive round offered as our small but heart-felt tribute to the World's Strangest Heroes! !